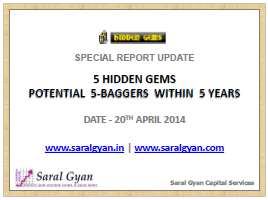 We are pleased to inform you that 5 Hidden Gems – Potential 5-Baggers within 5 Years Report Update - Apr'14 has been recently released by us. Original report 5 Hidden Gems - Potential 5-Baggers within 5 Years was released on 26th July’13 when there was lot of pessimism around the market and we find it as one of the best time to invest in some of the fundamentally strong small cap companies. This report update includes company’s performance, recent updates and development in these companies along with our views and recommendation with buy / sell / hold decisions along with fair price to accumulate any of these stocks. Today, there is a concern of downfall as broader indices Sensex and Nifty is at all time high levels. We expect market will be highly volatile with election results around the corner. As of now, stock market is in control of bulls with strong positive bias towards Ab ki Baar – Modi Sarkar (this time – Modi led BJP Government). In case of any negative surprises in election results, major indices may see a downfall of 10 – 15% or vice versa if it’s a majority win. However, any correction must be considered as a buying opportunity as long term outlook is bullish for equities. We believe that bear market of last 6 years (since Jan 2008) is over and equities will outperform all other asset class in coming years. You will agree that Investment decisions for long term can’t be taken by timing the market movement. It is important to understand the Industry potential, company’s fundamentals and valuations with a long term perspective. We evaluated these stocks with a long term view (2-5 years), we firmly believe that good quality businesses in India will continue to deliver strong double digit growth and its always logical to invest in those businesses which deliver better returns than any other asset class. Our team published special report 5 Hidden Gems - Potential 5 Baggers within 5 Years with an objective to achieve average annualized returns of 38% each year to achieve 5-Bagger returns in period of 5 years. As illustrated in table below, if all these companies generate returns on your investment @ 38% annually, your investment will be 5 fold in period of 5 years. Even if we take conservative scenario considering that only one out of five achieve CAGR of 38% and remaining four delivers CAGR of 20%, your investment will be trebled (3 times) in period of 5 years which is also good compared to returns from other asset classes or major indices - Sensex and Nifty. However, our team is confident enough to achieve 5 times returns in period of 5 years by monitoring performance of these companies and taking corrective measures in case any of them does not perform up to our expectations. Zero or negligible debt on books with healthy cash flows. Increasing EPS, single digit PE ratio with ROE and ROCE above 20% in last 5 years. Zero or negligible share holdings of Institutions (FIIs & DIIs) to get first mover advantage. We are glad to share that 4 out of 5 Hidden Gems have given returns in the range of 90% to 180% in matter of just 9 months. Average returns of our 5 Hidden Gems as on date is 112% compared to Sensex returns of 19% and Small Cap index returns of 38% since 26th July’13, outperformed small cap index by 93% and Sensex by whopping 87%. As Sensex and Nifty are at all time high, we have not suggested aggressive buying in these companies at current levels. But to ensure that we do not miss good investment opportunities, we have suggested initial allocation of 2-3% which can be increased further at suggested levels in the report in case of correction in stock prices. Note: If you wish to receive our Special Report 5 Hidden Gems : Potential 5-Baggers in 5 Years – Apr’14 update, simply subscribe to Hidden Gems or any of our Hidden Gem combo pack and we will send you the report without any extra charges! To know more about our services and annual subscription charges, click here.